Have the ceremony as late as possible – or organise a lot of things to do! Try to have the ceremony as late as you possibly can. By having the ceremony later you are drastically reducing the amount of downtime that your guests will have during your wedding. If your wedding starts at midday, and typically lasts for one hour you are usually completed by 1 p.m. With the short amount of time it takes to get to your reception, and your wedding breakfast then starts at 4 p.m., this give your guests 3 hours between the end of your ceremony and the beginning of your wedding breakfast. This time the guests are hanging around and waiting can sometimes lead to a lul during your wedding. This is fine as long as you have lots of things planned for your guests to do during the day like such as Garden games or heavy drinking. This lul can be avoided however, by having your wedding ceremony at 2 p.m., not midday. By doing this you can increase the flow to your wedding so everything moves swiftly from one event to another and can help with keeping your wedding to run smoothly. Distracted guests can lead to them behaving mischievously at your wedding reception, or even drinking themselves into a stupor, also leading to missbehaviour. By keeping everything running timely, you will not only improve the flow of your wedding, keep your guests entertained, you will also be inadvertently keeping your guests out of trouble! Don’t allow phones in the church! Every bride wants that shot of her walking down the aisle with tears in her eyes. Every guest wants to get that shot. It’s such a glorious shot that everyone wants a piece of it. The problem with this, is that everybody leans out into the aisle to get the shot of you. What invariably happens is that these guests that are trying to get this glorious photograph end up getting in the way of the photographer and videographer that you have paid a lot of money for to make sure that shot is a banger. Every videographer or photographer has had that shot of auntie Dorothy’s back as they leant into the aisle to get a photograph of you, inadvertently ruining our shot! By asking your guests to leave their phones in their pockets not only will you be avoiding the possibility of the phone going off in the church, but you would also be maximising the ability of your photographer and videographer, that you have paid a lot of money for comma to get that glorious shot of you walking down the aisle. Just ask your vicar to make that announcement before your wedding, it can make the difference between great shots of you and great shots of someone’s arms! Wait to walk down the aisle, and take your time! When it comes to your time walking down the aisle, don’t be afraid to milk your moment. Take your time, allow plenty of time for your bridesmaids, the vicar or anybody else, to clear the aisle before you walk down there. If you fail to do this it can lead to shots of you being blocked as you walk down the aisle. 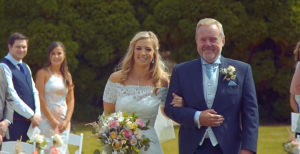 Too many times as a videographer have I seen Brides with their fathers run down the aisle, or brides follow the within a metre of the vicar, so that the only thing the videography can see is the vicars face. Sometimes the Bride follow the Bridesmaids too closely. All these things though could lead to the shot of you walking down the aisle to be obstructed. Take your time, walk slowly, this is your moment that you’ve waited your whole life for, to walk down the aisle and see the love of your life standing at the end waiting for you. There is a tendency to get there so he doesn’t run away, but don’t worry he will be standing there at the end, no matter how long you take! So go and nice and slowly and allow the aisle to clear before you walk down it. Any keen guests/photographers to be kindly reminded that there are professionals on hand! We understand that lots of your guests to are enthusiastic photographers. Many of them carry high quality cameras and lenses, but please please please, ask these guests to be mindful of the professional photographers and videographers that you have paid for at your wedding. Many times I have filmed brides and grooms in intimate moments only to trip over an enthusiastic guest with a DSLR camera, ruining not only the shot, but also the moment. We have filmed lovely moments from afar, only to have said guest pop in between us and the couple to get their photographs. Sometimes you may not have paid for a photographer but you have a videographer, or vice versa, and you have asked one of your guests to perform the photography duties instead of paying a professional. This is fine, and if this is the case, please let the professional videographer know that you have asked the guest to do this, so that the videographer and the guest can work together. If you do not inform the videographer working that the guest has been asked to do the photography. The guest can be seen as a hindrance to the videographer, all it takes is a little conversation with the pro telling them you have asked your guests to take some quality photographs to smooth things over! Speeches after the meal – get them fed and watered! The reason for this is threefold. Firstly, if you choose to have the speeches before the meal, your guests may not have heating for a very long time. This can cause them to be disengaged from the speeches, as they are getting very very hungry. By having the speeches after the meal, you can ensure that they have been well fed! Secondly, by having the speeches after the meal, your guests will invariably have had a drink or two, which will cause them to be a little more inebriated than they would be before the meal! This can cause a great deal more engagement with the speaker and the gags to get a little more laughter! Thirdly, by having the speeches after the meal, you are giving yourself time to have a drink, relax and compose yourself before doing the big speech. It can often be a daunting task speaking in front of a large group of your friends and family, and having a glass of wine or two can often help with these nerves! Listen to the photographers and videographers – if they say sunset, you go! If your photographer or videographer is telling you to go outside right now because there’s a banging sunset, go with them! They are only asking you for the benefit of you, because they know they will be an outstanding shot at the end of it. Glorious sunsets only happen once in a while, and when they happen, it’s important that they are maximised. You’re photographer or videographer may see a shot that has to happen very quickly. In this case go with them, they are again only doing it because they want the best for you and your photographs. During a sunset, five minutes can make all the difference! Five minutes earlier, you’ve got a glorious shot. Five minutes later, it’s all gone and you missed it, so try to accommodate the photographer and videographer’s wishes as much as you can.